The mobile phone is becoming a central component of everyday life for many North Koreans and ajummas are not exceptional. According to Chosun ilbo, they have their own-designed mobile phone, Arirang, but Samsung’s Galaxy or iPhone is popular among people in North Korea. They think Samsung or iPhone have better quality than their ‘Arirang’ phone. And this newspaper reported that many of Pyong-yang (capital city of North Korea) ajummas own the smartphones. Also it reported that having Samsung’s Galaxy or iPhone symbolise wealth among these ajummas in Pyong-yang. North Korean ajummas took photos of fireworks during New Year in Pyong-yang city. I found this news report during my research this afternoon. And I couldn’t find any further articles about ajummas (or women) and smartphones in North Korea but it was interesting to read this news report about Pyong-yang ajummas and their smartphones. I tried to find any Ajumma Instagram Star in South Korea but it was hard to find ajummas who are using Instagram in daily base. 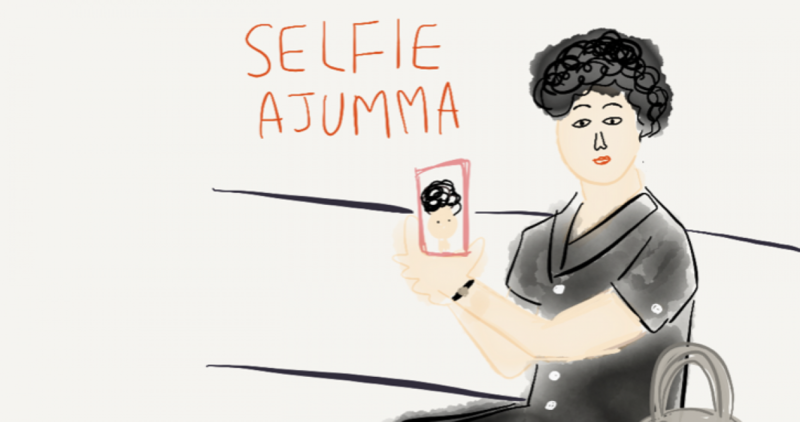 Maybe there will be a reason why ajummas (over 50) are hardly use Instagram to upload their photos compared with other younger ajummas. (I can find ajumma Instagram users easily but they’re mostly under 40s who are mothers have younger children (primary school kids). So it might be interesting to find why those over 50 ajummas aren’t using Instagram and then what’s their favourite photo apps and why do they choose those apps rather than using Instagram? I think everyone is same and people got influenced from some culture or society. North Korea might be similar to other countries even though I don’t know about them very well. Here is a photo of women with her mobile phone in North Korea. This photo makes me to think about what popular culture or mobile phone culture again. Previous Previous post: 아줌마는 아니지만, my Mung! Next Next post: 아줌마는 꼭 언니가 되어야 할까?